I ♥ Motherhood: Below Freezing Birthday Farm Fun! Yesterday was FREEZING. Literally -1 all day. However we had a birthday party to go to at Godstone Farm so off we went wrapped up warm with hats, gloves, scarves and wellies. No sooner had we got out of the car there was a casualty of the mud - Isla fell over on the way in and her Sheepy got the brunt of it and was covered in mud. Cleaned up as best we could we then headed to the play barn for some birthday soft play for the kids and hot drinks for the adults. Fortunately the play barn is quite cosy and the kids had a great time. Following that there was a ride on the tractor round the farm which the kids loved! Next up birthday lunch and cake in the barn which was a bit parky and then a walk around to see the new additions to the farm - piglets, lambs and ducklings! 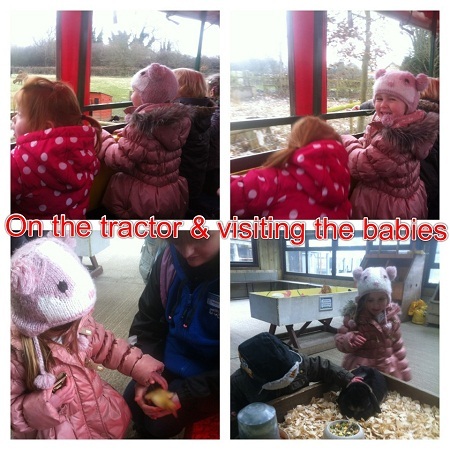 I particularly liked being in the warm near the baby ducklings...... My favourite bit was watching Noah stroking the rabbit and getting right up close to it's face and saying "Hello Rabbit!". 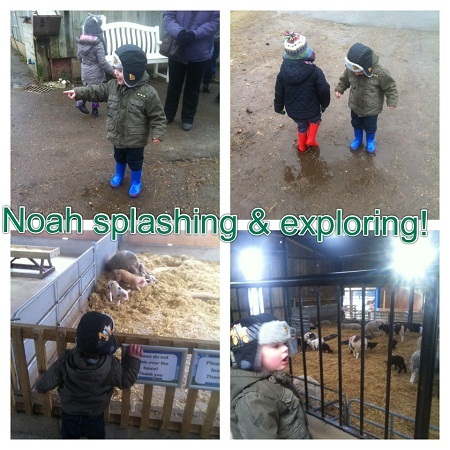 Not sure the rabbit was as happy as Noah was! A lot of fun was had despite the cold and the kids snoozed for a good 90 minutes on returning home. I on the other hand suffered from a terrible cold weather induced headache and took a good 2 hours to thaw out, helped by lots of tea and biscuits! That looks like a day out at Coombe Mill! Perfect for a birthday treat, sounds like a fun day despite the cold. They all look like they are loving it there. Thank you for linking up with me on Country Kids.